Alzheimer’s and Dementia caregivers are 16 million strong today and will grow 40% in the next ten years. 40%! It’s been called the new PLAGUE. The youngest person diagnosed is 29. It crosses every race, gender and is the epitome of “inclusive.” 500k young adults are dropping out of college to take care of a parent with Early Onset Alzheimer’s. Are you one of them or know one? Care Better is here to help. We are an app and platform connecting those who care for a loved one with Alzheimer’s and Dementia. It’s a community designed just for us, to find the support we need to do the best job we can by texting each other and finding non-medical experts to advise us along the way. 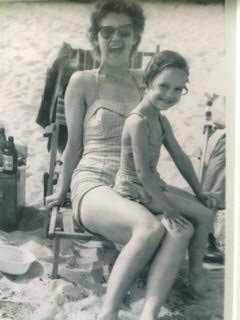 The photo in this article is circa 1963 of me and my mom on the Jersey shore, taken by my father, but it helps me remember why I went through a grueling Silicon Valley Accelerator program. Check out that crazy experience in my blog. Why I find so much inspiration from the love and struggle of caregivers I speak with every day. Why I know, deeply, that we are not meant to handle every aspect of this long journey alone. Why I delight in the magic of technology to connect us by simply pressing a button on our phones in our hands. Our relationships are complicated. Brothers, sisters, partners, friends, daughters and sons each find caring for a loved one with its own intensity and challenges. I could use your help if you are a caregiver or know one. We need users to test our beta app in a closed, safe, inclusive environment full of diversity with our shared bond of dementia. What does this new behavior mean at sunset? Why won’t his family help me? What should I feed her? How can I find help to go on vacation? How do I handle a move for her? Get questions answered from vetted experts and find the support your need. It’s in the palm of your hand. With your help, we can create a stunning and meaningful community of people who understand and share the need to do a good job caring for someone they love with Dementia. Whether you are far away from your loved one or live with them, we need you. Join us in a closed beta test of the app. Please email if you are interested in participating in the beta test.